In his earlier career, Wages helped launch Turner Classic Movies and even founded a record label, but he’s always been interested in clothes. In January he began rebranding his Westside menswear shop, Tweeds, with his own name. He designs almost everything himself—from classic wool suiting to colorful madras shirts (which you can see on Zach Galifianakis in Keeping Up with the Joneses). This month he’s rolling out a footwear collaboration with Atlanta-based Cord Shoes and Boots. Hails from I was born in Athens but raised on Lake Lanier. It was great growing up on the water. I got my captain’s license. Neighborhood West Midtown. I bought my home almost 10 years ago, and I remember going to West Egg and thinking, I could see myself here. Early style I grew up in a small town, where if you wore anything besides T-shirts and jeans you got made fun of, but I wore nice crisp Oxfords and loafers. Family affair My grandfather was a farmer, but he still wore custom-made suits for business meetings. It wasn’t for vanity but out of respect. Style icons Paul Newman. He was polished, minimal, understated, masculine, and elegant. First concert The Champagne Jam in 1978 at Grant Field with Santana, the Doobie Brothers, and Atlanta Rhythm Section. My parents snuck me in. Go-to restaurant Hankook Taqueria for their barbecue pork sliders and sesame fries. Signature drink Ginger beer, Black Maple Hill bourbon, and lime. Designers you love I have an original Ernest Alexander banker’s weekender bag in waxed canvas and chocolate leather that has aged like a fine wine. And I also love my beautiful Bond peacoat from Billy Reid. Travel destination Portland. I always stay at the Ace, go to Stumptown Coffee, and walk down to the river to lie in the grass. 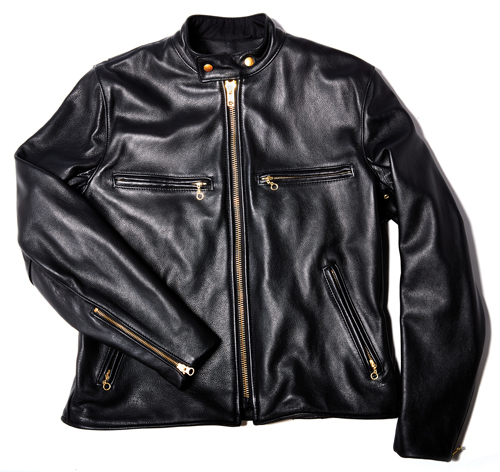 This fall Wages is introducing a full-grain tumbled leather motorcycle jacket ($895) with brass hardware. “It’s broken in to a point where it feels like butter,” he says.